Alaïa can say that. He has worked longer and harder than most to achieve his goals. He is passionately committed to his craft. It is the stuff of fashion folklore that he cuts, pins and sews into the wee small hours before passing his designs onto the studio when their day begins. His studio is cluttered, to say the very least, so full of treasures that anyone even remotely interested in fashion could spend hours rifling through rail upon rail. Here is a tiny gold crocodile jacket moulded to fit an equally fine torso. Crocodile skin is tough and notoriously difficult to work with. To manipulate it to the point where it appears so malleable – almost seamless – is nothing short of genius. There is a ruby red silk velvet shift, so light, liquid and apparently simple that it is a thing of wonder to behold. There are knits. Of course there are knits: their surfaces peppered with tiny holes, sprouting raffia or feathered skirts or corrugated into three-dimensional textures that defy explanation. How does Azzedine Alaïa do that? 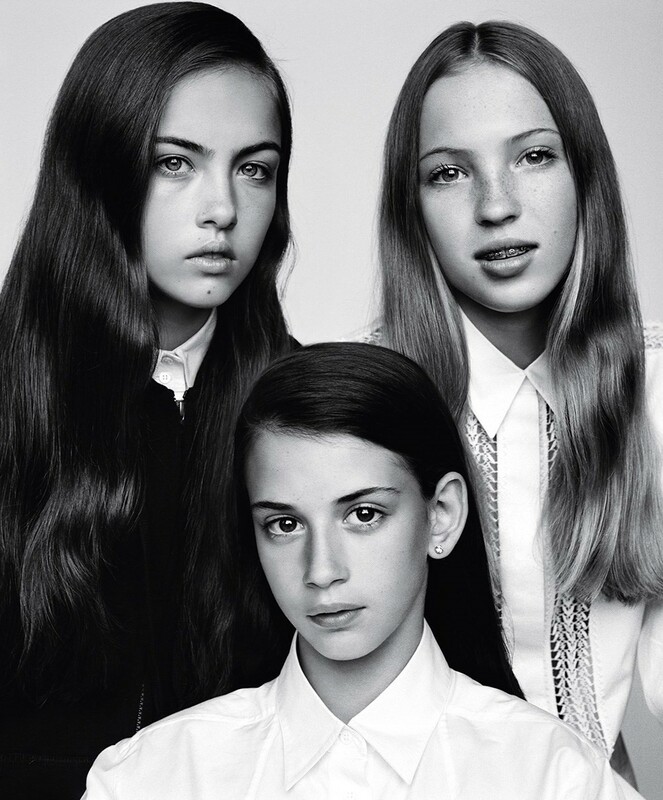 Photography by Alasdair McLellan, Styling by Katy EnglandStella, Lila and Ava are wearing cotton shirts, Stella is wearing her own hoodie. Photography by Alasdair McLellan, Styling by Katy EnglandReba is wearing a ribbed knit dress, Jess is wearing a zip-front wool gabardine jumpsuit. Additional interviews Olivia Singer; Hair Malcolm Edwards at Art Partner; Hair for Naomi Campbell Cyndia Harvey at Streeters using Oribe; Make-up Miranda Joyce at Streeters using Bobbi Brown; Make-up for Naomi Campbell Alex Babsky at Jed Root using Lancôme; Models Ana Carolina Reis at Women Management, Ava and Stella Jones, Ella Merryweather at Tess Management, Estella Boersma at Viva Model Management, Iris and Rafferty Law at Tess Management, Izzy Davis, Jess and Reba Maybury at Elite Models, Kate Moss at KMA and Lila Grace Moss, Livvy Banks, Matilde and Otto Rastelli at Elite Models, Naomi Campbell at Tess Management, Susie Cave at Premier Model Management, and Yasmin Wijnaldum at Elite Models; Casting Jess Hallett at Streeters; Set design Poppy Bartlett at The Magnet Agency; Manicure Marian Newman at Streeters using Vinylux Sweet Squared; Manicure for Naomi Campbell Liza Smith using CND; Photographic assistants Lex Kembery, Matthew Healy, and Simon Mackinlay; Styling assistants James Campbell, Lydia Simpson, and Aurora Burn; Hair assistants Sophie Anderson and Becky Dobney; Make-up assistant Hannah Maestranzi; Manicure assistant Jennie Nippard; Set design assistant Roxy Walton; Casting assistant Caitlin Prosser; Producer Ragi Dholakia; Production manager Claire Huish; Production assistants Kyal Crase and Jordan Kilford; Special thanks to Output London.